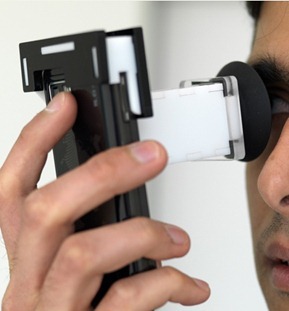 Imagine, if you can use your Smartphone to get your eyes tested within less than 30 seconds. That’s exactly the innovation created by researchers (led by Dr. Ramesh Raskar) at MIT Labs. EyeNetra is a very small, cheap device (that costs less than Rs. 100) that can be clipped on to a regular smartphone and which can be used to detect vision problems including detecting their lens prescription, astigmatism, and even cataract. Since it is so cheap, and portable, it can be used in villages all over the world. In India alone, about 6% of the people wear glasses, but it is estimated that about 40% of them should be wearing them. That’s 200 million people in India who don’t have eye glasses that are needed. EyeNetra is setting up a team in India which will work with hospitals, government organizations, NGOs and other groups to take the EyeNetra device to rural India. A smart phone is an amazing device. There is lots and lots you could do with it. Think of various ways in which you can use it for purposes that it was not originally intended for. There is the camera, the display, accelerometer, GPS, internet, Bluetooth, RF. You can do magic! Looking around corners: How is this done? Use the flash from a camera. The light hits a wall / door / obstacle and bounces off in various directions. Some of the bounced photons actually go around the corner, hit various objects that are not directly visible, and then an even smaller fraction of them bounce back all the way to the camera. If you’re clever about analyzing the photons, you can actually figure out where each photon has come from and hence reconstruct features of the objects around the camera. For this you need to do an extremely fast camera – which does one trillion frames per second. Seems very interesting Waiting 4 it to come to India. Just listened to an excellent talk by Dr. Raskar.. more later and on http://raskar.info. I HAVE GONE THROUGH THE NEWS AND REALLY IMPRESSED BY THE FUNCTION OF THE DEVICE -NETRA. IT IS A GREAT INVENTION AND WILL DEFINITELY HELP THE EYE HEALTH WORKERS WORKING IN RURAL INDIA.PLEASE INFORM ME ABOUT THE DEALERS OF THE DEVICE IN PUNE AND MUMBAI. 1. There are no side-effects to this gadget. This gadget is simply a smartphone screen and lenses. Nothing else. So this is no more dangerous than looking at a MMS clip on your mobile. 2. Right now this gadget will only tell you your “number”. i.e. whether you need corrective eyeglasses and what the power is (spherical/cylindrical etc). The Motia/Catra device will be able to tell you about cataract too. For these two specific things, I believe the device(s) will be as accurate as going to an eye-specialist. But that’s it. The device does not check for other eye problems that a real doctor would check for. So, I still don’t think the device can replace an eye-specialist. 3. However, “is this device as good as an eye-specialist” is the wrong question to ask. The correct question is: “if I am in a village and there is no eye-specialist within 50km, should I use this device to get my eyes checked?” – and then you will realize that the answer is absolutely yes. This device is not intended for personal use by people in cities – they’re better off going to a doctor on a regular basis. Its primary purpose is to allow eye checkups to reach areas where doctors cannot. Amazing!!!!! I must call technology is helping human race here. Now why should one stand in a long queue or pay heavy bills of eye-specialist for an eye check-up. All I need to know if there is any side effect also. If it is safe to use this gadget for a regular eye check-up? Also if it is accurate enough that people avoid going to eye-specialist for a general chec-ups.